How many times can you say the word “sausage” in a conversation that isn’t about lunch? In English, you might sound a little odd. 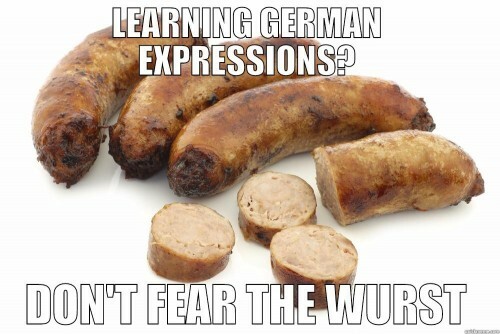 In German, I challenge you to say “sausage” twenty times. As it turns out, that might not be such a difficult challenge when speaking German. It’s all too easy to talk about sausage without actually talking about sausage. German, like English, is a language generously sprinkled with idiomatic expressions. Learning to become comfortable with just a handful of them will surely improve your confidence, prevent you from coming off sounding like a robot and help bridge the gap from beginner to intermediate learning. Learning idioms in another language also comes with the added intellectual bonus of giving you fresh eyes with which to reevaluate the expressions you already use in your mother tongue. That ought to make you feel like one sharp cookie. Wait, what? Sharp cookie? Huh. Hmm. This type of self-reflective exercise will stretch out the language-learning muscles in your brain and prepare your mind for the weird and wonderful sayings that other languages have to offer, which, in the case of German, are very likely related to pork products. In Germany, the pig is pretty popular. A symbol for various things, to get lucky is to “have pig” (Schwein haben), but if your German skills are unter den Sau, “under the pig,” they’re not very good at all. Hopefully, though, you won’t think your pig whistles (Ich glaube mein Schwein pfeift) because in that case you’ve just totally lost your mind. Now, on to the best of the Wurst. Literally: He thinks he gets an extra sausage. Does he think he’s special? Like he gets an extra sausage? We all know someone like this. Literally: You poor little sausage. Pay no mind to Sally over there. She’s just acting the insulted sausage: pouting, because she didn’t get her way. Literally: To let someone take the sausage off your bread. Stand up for yourself! Don’t let anyone take the sausage off your bread. You’re too good to be taken advantage of like that. Literally: That is sausage to me. I don’t care about that at all. Frankly, my dear, I don’t give a sausage. Literally: Looks like a stuffed sausage. Literally: It goes about the sausage. Okay now, there are two minutes left in the game! It’s crunch time people! It’s all about the sausage! Literally: Everything has an end, only the sausage has two. To end this sausage spree on an existential note: everything has an end—except for the sausage—only the sausage has two. Okay. So sometimes (if you’re extra hungry, I guess) there are a few other food options in Germany besides the majestic Schweinefleisch. Alternative table-talk has predictably, like in English, flavored (haha, see what I did there?) all kinds of idiomatic expressions. Here are more food-related German expressions that aren’t about sausage. Literally: To talk around the hot soup/porridge. Literally: To smear honey around the mouth. Literally: To gut someone like a Christmas goose. Little Clara is celebrating her fourth birthday today. She’s not but a wee little thing, barely three cheeses high! I don’t know what it is, but I just love this one. It literally refers to the height of three wheels of cheese stacked on top of each other. This is also a great example of how German creates single words for a variety of fascinating concepts and situations; for more on that, check out this post! Mary always offers her two cents on whatever we’re talking about—whether she’s asked for her opinion or not. She’s always adding her mustard to the conversation. Someone’s spreading rumors? Well don’t look in my direction. That’s got nothing to do with me. That sort of thing is not my beer. Literally: Tomatoes on the eyes. Seriously! Are you blind!? Do you have tomatoes on your eyes!?? Our country is taking baby steps toward a brighter tomorrow. We’re baking little rolls. Literally: To show one’s chocolate side. We want to present our best work to the client at the next meeting. We’ll show them our good side. Our chocolate side. Literally: Not good cherry eating. Yeah…don’t bother inviting Tim tonight. He woke up on the wrong side of the bed this morning. With him is not good cherry eating. We might say in English that he’s not a man you want to mess with. Literally: To give someone a basket. Before properly researching this phrase I asked a German friend of mine what she thought it might mean. She replied, “ I dunno, maybe it’s like, ‘Yeah… I’d rather not, thanks, but…um…here’s a nice basket as a consolation prize?’ Everyone needs baskets.” I think I like that better. 20. du kannst mich mal! Literally: You can me once!! Okay, so technically this is more of an “elision” than an idiomatic expression. However, I enjoy the completely nonsensical English translation so much (You can me once!!) that I felt compelled to include it on this list. “You can me once” implies a few things—leaves a few words to the imagination—which I am not completely comfortable repeating here…but just imagine what you can do to someone who is most certainly upset with you. I’ll give you a hint: This is very similar to the English expression, “you can kiss my…” you get the point. Literally: Life is not a pony farm. Ain’t that the truth! Life, my friends, is quite simply not a pony farm. And, well, there you have it! Twenty-one German idioms for all sorts of situations to make you sound like a pro (if a slightly food-obsessed one). Oh, and for even more great German idioms, check out this post!